Deep-sea habitat on Davidson Seamount at 2688m depths. 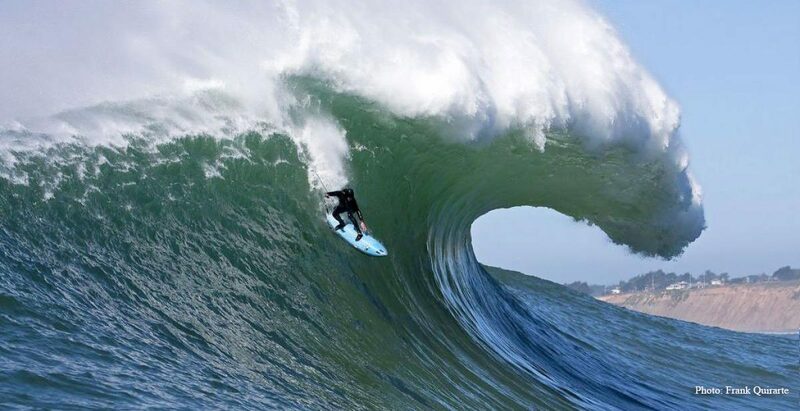 Photo: Monterey National Marine Sanctuary. Last week I joined hundreds of scientists across the country and globe calling for greater protection of our deep sea habitats. The effort to protect the deep sea (depths > 3500m) has been ongoing for many years with groups such as Pew and Oceana joining forces with other organizations and scientists. Why protect the deep sea? It is a vast undersea area that lives in perpetual darkness and is currently not threatened by extractive activities such as fishing and mining. However, that can change, possibly quickly, so read my editorial published last week in the Sacramento Bee; the day the Pacific Fishery Management council, the Federal agency responsible for developing fishery management plans, was meeting in Sacramento to consider whether protections were warranted. Imagine an area nearly as large as the state of California, a frontier of largely unexplored terrain known to harbor forms of life hundreds or even thousands of years old. A place where the number of species is so high it rivals the diversity of coral reefs but remains an ecological enigma. 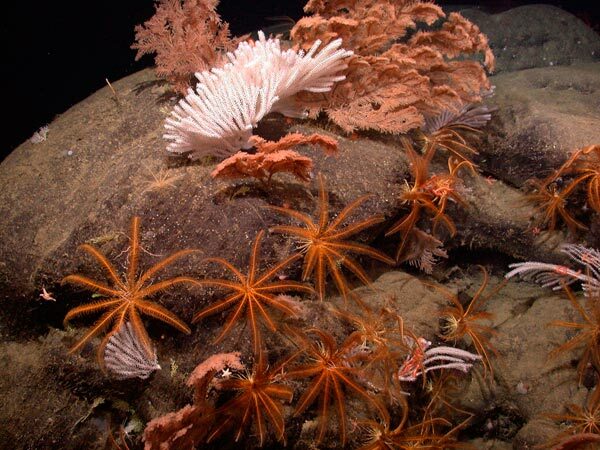 Welcome to the deep sea, a huge area off the California coast more than 11,000-feet deep that is extremely valuable ecologically and currently unprotected. These deep sea habitats are huge and mostly unexplored. These untouched, unprotected areas of seafloor comprise a surprisingly large area of American territory off our coast – roughly 40 percent of all U.S. territory out to 200 miles from the California shore. Even though we know very little about this area as exploring it is extremely costly and difficult, we do know this: The more we look, the more we discover. Using remotely operated submersibles, scientists have documented ecologically important habitat that sustains marine life and indirectly human life. Ancient deep sea corals and sponges are extremely long-lived and serve as “ecosystem engineers” because they create habitat that myriad species of fish and invertebrates need to survive. The deep seafloor also includes areas of soft-bottom habitat that, at a glance, appear to be inert mud. Scientists who have probed more closely are discovering a rich array of life – including sea stars, urchins and worms – that capture a vast amount of greenhouse gases like carbon dioxide and methane, and help regulate climate. Many of these species are long-lived, slow-growing and fragile. Scientists have documented long-lasting damage to deep sea environments from bottom trawling, a type of fishing that involves the use of large nets dragging along the seafloor. My research off the Oregon coast documented that bottom trawls reduce the abundance of sea pens by 99 percent and decreased the overall abundance of bottom-dwelling invertebrates by more than half. In even deeper areas of seafloor, we know that a single trawl can damage sensitive coral and sponges that may have grown over centuries or even millennia. 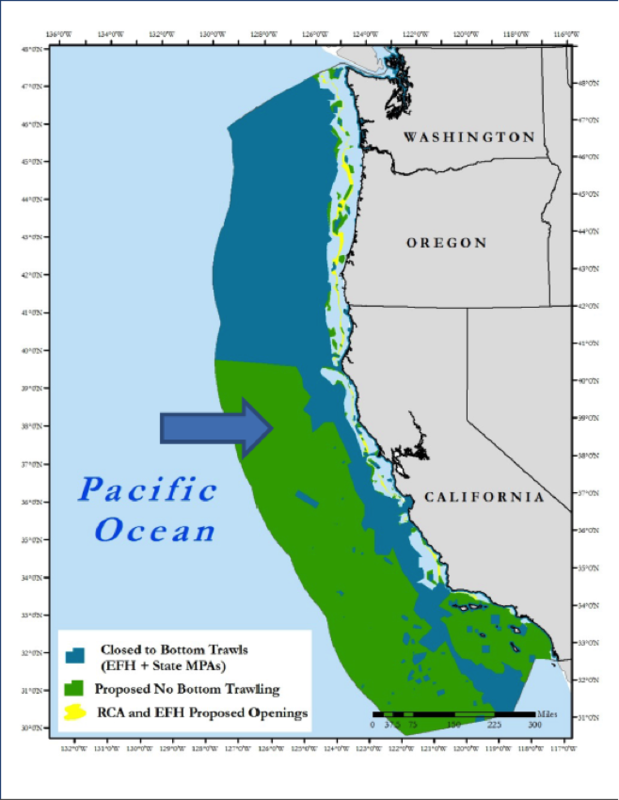 Now is the time to put protections in place because we know technological advancements will, sooner or later, enable bottom-trawling and mining to expand into these pristine areas of deep water seafloor off the California shore. It’s important to act now, well before fishing expands into deep-water areas so that no one is taken by surprise. The deep seafloor off our coast is a tremendous natural asset worthy of protection by the stewards of our ocean resources. By acting now, the Pacific Fishery Management Council has an opportunity to pass it on to future generations. Brian Tissot is director of the Marine Laboratory and Humboldt Marine and Coastal Science Institute at Humboldt State University in Arcata. At the same time Dr. Andrew Thurber, a marine scientists at Oregon State University wrote a sign-on letter for scientists to support deep sea protection. 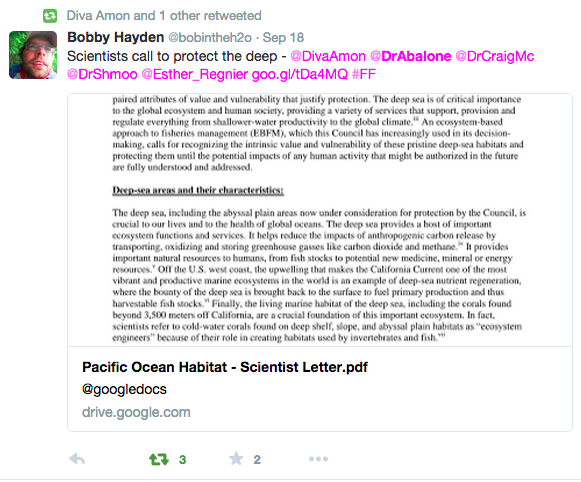 The Pacific Habitat Scientist Sign-on Letter had 101 signatures from marine scientists with some expertise in deep sea habitats. Before the Council made a decision Dr. Thurber read his letter and my editorial as testimony to the Council. In the meantime Twitter was used to spread the word and gather more support for the movement. It worked! At the end of their meeting last week the Council voted to include a deep-sea protection alternative in their fishery management plan so that it will be considered in their future analysis of possible actions. Stay tuned! In the meantime here’a Podcast of an interview with me on Speak Up for Blue by Andrew Lewin on protecting deep-sea habitats.